The already decimated Boston Bruins will have an even tougher road ahead without Bergeron. Bruins forward Patrice Bergeron is being sidelined with a rib and sternoclavicular injury. He will be re-evaluated in four weeks. 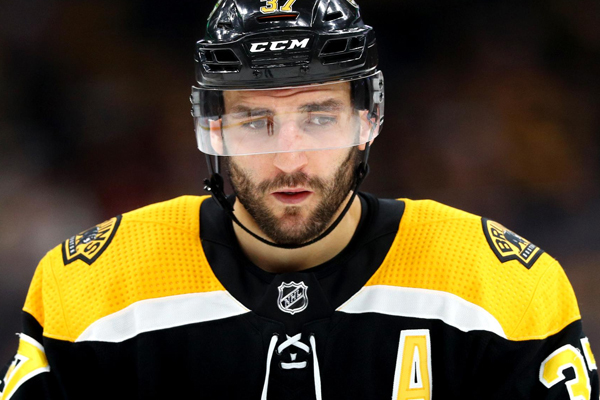 Bergeron was injured against the Dallas Stars on Friday when he was hit into the boards during the second period. He returned to finish that game against the Stars, but was clearly in a considerable amount of pain. Losing him is a huge blow for Boston, especially since the Bruins are already dealing with a slew of injuries affecting many players such as: Kevan Miller, Charlie McAvoy, Urho Vaakanainen, Brandon Carlo, Zdeno Chara and John Moore. In 19 games this season Bergeron has nine goals and 26 points while playing on a line with Brad Marchand and David Pastrnak. Now with him out, Anders Bjork will get a chance to play with Pastrnak and center David Krejci, while Marchand finds himself with Joakim Nordstrom and Jake DeBrusk.